Primarily, three genera of mange mites infect cattle: Sarcoptes scabiei var. bovis, Psoroptes ovis and Chorioptes bovis. The female S. scabiei var. bovis mites burrow in the superficial layers of the skin and evidently consume body fluids directly. P. bovis mites do not burrow in the skin but live at the base of hairs and cause irritation by piercing the skin. The mites are believed to feed on the superficial lipid emulsion of lymph, skin cells and skin secretions. C. bovis is a non-invasive mite, it is free-roaming over the skin and is thought to feed on dead tissue. It is evident that the living and feeding habits of the mange mites will impact the amount of drug that will be absorbed and the efficacy of the different formulations of the MLs. When considering the efficacy of the different MLs against the mange mites, it is important to bear in mind that self-cure is not rare in P. ovis- (Pouplard et al., 1990) and C. bovis-infected cattle (Losson, personal communication). Consequently, results must be interpreted with caution in studies without control animals. Moreover, the evaluation of therapeutic efficacy often relies only on the demonstration or absence of mites. This can have major drawbacks: (i) dead mites can be found several weeks after an effective treatment, making interpretation of data sometimes difficult; (ii) the repeated collection of infected material from lightly infected animals may induce self-cure; and (iii) there is a weak correlation between mite counts and clinical evaluation (Lonneux et al., 1997). Only the injectable and pour-on formulations of the MLs seem to be effective against mange mites. Complete efficacy is lacking against mange mites following oral administration of ivermectin to cattle, presumably because less ivermectin is available to the site of infestation and it persists for a shorter duration compared with the subcutaneous route (Meleney, 1982; Benz et al., 1989). Among the mange mites, S. scabiei var. bovis is the most sensitive to all registered MLs, including both injectable and pour-on formulations. 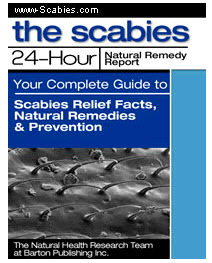 Infestations with S. scabiei were completely eliminated (i.e. an efficacy of 100%) after abamectin treatment (injectable) (Heinze-Mutz et al., 1993a), doramectin injectable (Logan et al., 1993) and topical application (Rooney et al., 1999), eprinomectin pour-on (Barth et al., 1997a; Thompson et al., 1997), ivermectin injectable and applied topically (Soll et al., 1987, 1992b; Barth and Preston, 1988), and finally moxidectin injectable and pour-on (Losson and Lonneux, 1993a; Matthes et al, 1993). Barth and Preston (1988) concluded from the results of three trials that it is apparent that the topical formulation of ivermectin administered to healthy skin is fully effective against sarcoptic mange, but that its efficacy was impaired when the drug was applied over severe lesions caused by the parasite. This presumably results from reduced absorption of ivermectin at these thickened and encrusted areas, resulting in lower plasma levels of ivermectin, which would also reduce the efficacy of the drug against internal parasites. An efficacy of more than 99% was recorded against P. ovis mange mites after abamectin treatment (Heinze-Mutz et al., 1993a). Logan et al. (1993), Hendrickx et al. (1995) and Losson et al. (1996) showed that doramectin injectable completely eliminated a P. ovis infestation. Many studies described the excellent efficacy of injectable ivermectin against P. ovis in cattle (Guillot and Meleney, 1982; Meleney, 1982; Wright and Guillot, 1984; Soll et al., 1987; Benz et al., 1989; Lonneux et al., 1997). Topical and injectable formulations of moxidectin gave similar parasitological and clinical results with full efficacy (Lonneux and Losson, 1992; Lonneux et al., 1997). The topical formulations of doramectin, eprinomectin and ivermectin (Benz et al., 1989) did not always completely eliminate P. ovis infections and are therefore not recommended for the treatment of P. ovis infections. However, Lonneux et al. (1997) showed that all cattle treated with ivermectin pour-on were parasitologically negative 28 and 42 days after treatment. Although many studies reported that MLs completely eliminated mite populations, the clinical efficacy seems less consistent. In practice, often more than one treatment may be needed to obtain clinical cure, especially when the animals are suffering from the hyperkeratotic form of the disease (Lonneux and Losson, 1992, unpublished studies). A therapeutic failure, that is survival of a few mites that remained undetected, may result from difficulties of the drug reaching the mites in the hyper-keratotic lesions or reinfection from the environment. The use of systematic endectocides such as MLs necessitates a period of quarantine after treatment before the treated animals are reintroduced to a healthy herd (Meleney and Christy, 1978; Guillot and Meleney, 1982; Guillot et al., 1986; Strickland and Gerrish, 1987; Losson et al, 1996). The recommended isolation period varies from 7 to 21 days. Scheffler (1995) and Losson et al. (1998) showed a high efficacy of doramectin injectable against C. bovis in naturally infected animals. Doramectin pour-on had a 100% efficacy against C. bovis in naturally infested cattle, and efficacy was greater than 99% in artificially infested cattle (Rooney et al., 1999). Eprinomectin is highly effective (>95%) against C. bovis (Shoop et al, 1996; Barth et al, 1997a; Eagleson et al, 1997b). C. bovis is controlled adequately by the pour-on formulation of ivermectin (Barth and Preston, 1988). Although the dose rate of ivermectin in the topical formulation is 2.5 times greater than in the subcutaneous injection, it has been suggested that the improved efficacy of the pour-on formulation of ivermectin (compared with the injectable formulation) against C. bovis was due to the presence of the drug on the skin and hair of the animal since, in the trials with chorioptic mange, none of the lesions was located close to the area of application. No data are available on the distribution of ivermectin applied topically over the skin (stratum corneum) and hair coat, but products such as the synthetic pyrethroids are known to move extensively over the surface of the animal from sites of 'point' or 'strip' application (Jenkinson et al., 1986). Moxidectin injectable resulted in low to moderate reductions against C. bovis mites with large individual intervals in efficay (9-100%) (Losson and Lonneux, 1993a; Scheffler, 1995). This is in contrast to the moxidectin pour-on formulation that is fully effective against C. bovis within 14 days (Losson and Lonneux, 1996). Losson and Lonneux (1996) also assessed the activity of moxidectin cattle pour-on against C. bovis at a dosage of 0.25 mg kg-1, half the recommended therapeutic dosage. Although a marked effect on mite population and clinical conditions could be observed, activity was incomplete. Only a limited number of studies have been published on the persistent efficacy of the MLs against mange mites. Possible reasons may be the difficulties in setting up adequate protocols, the choice of challenge (natural or experimental) and/or interpretation of the results. Meleny et al. (1982) showed that an intramuscular ivermectin treatment protects cattle against P. bovis infestation for 3 weeks. In their study, they used direct challenge of stanchioned animals every 3 days as the infestation method. Clymer et al. (1997) demonstrated that a single treatment with doramectin injectable provided complete protection against infestation for 3 weeks and partial protection for an additional 2 weeks. The challenge infestation procedure used in their study, which involved the direct transfer of mite-infested material to animals prevented from self-grooming, represents a severe test of the protective capacity of the drug. In the face of a more natural challenge of exposure to infested animals, the period of complete protection conferred by doramectin was extended to 5 weeks. This was compared with a protection period of 4 weeks conferred by ivermectin in their study. It is interesting to observe that both ivermectin and doramectin demonstrate a longer period of residual protection with natural challenge than with artificial challenge, suggesting that the former is the better technique to use for predicting the protective efficacy of MLs under field use. Clymer et al. (1997) also designed a study to investigate the effects of grooming behaviour on the observed efficacy of the test drugs. It is not unusual for grooming activities that occur within groups of animals penned together to elicit a self-cure of scabies mite infestations. Comparison of the results from stanchioned animals where grooming was prevented and penned animals where normal grooming activities were permitted showed no differences in the period of complete protection conferred by either doramectin (5 weeks) or ivermectin (4 weeks). However, there was a difference between the two agents with respect to how soon, thereafter, significant mite infestations established. In the case of ivermectin, mite counts significantly greater than zero (complete protection) were observed 1 week later (at 5 weeks), whereas doramectin prevented establishment of infestations significantly greater than zero through to the last observation point (at 7 weeks).